After seeing Savanna´s strawberry rhubarb cake I had to make some cheesecake as well. 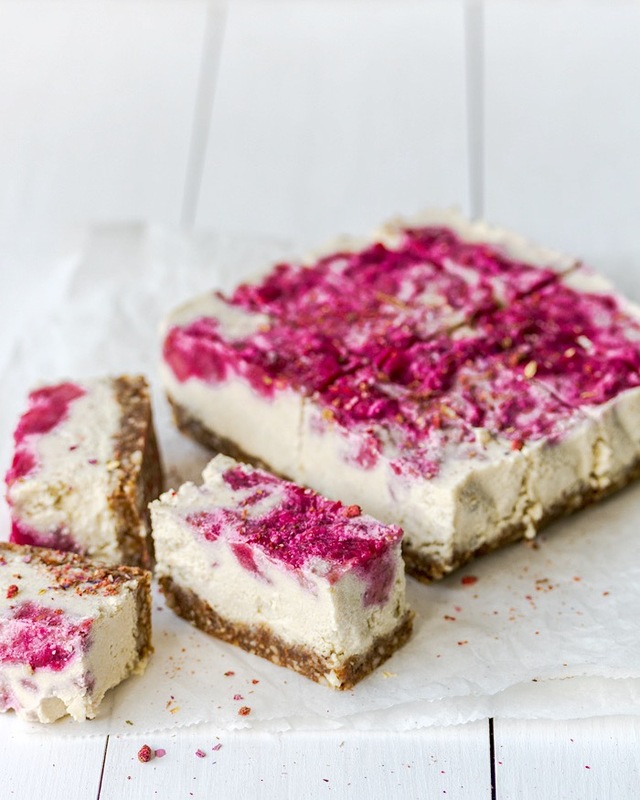 Vegan Rhubarb & Raspberry Cheesecake… Mmm. I miss these. These cheesecake slices turned out so good! 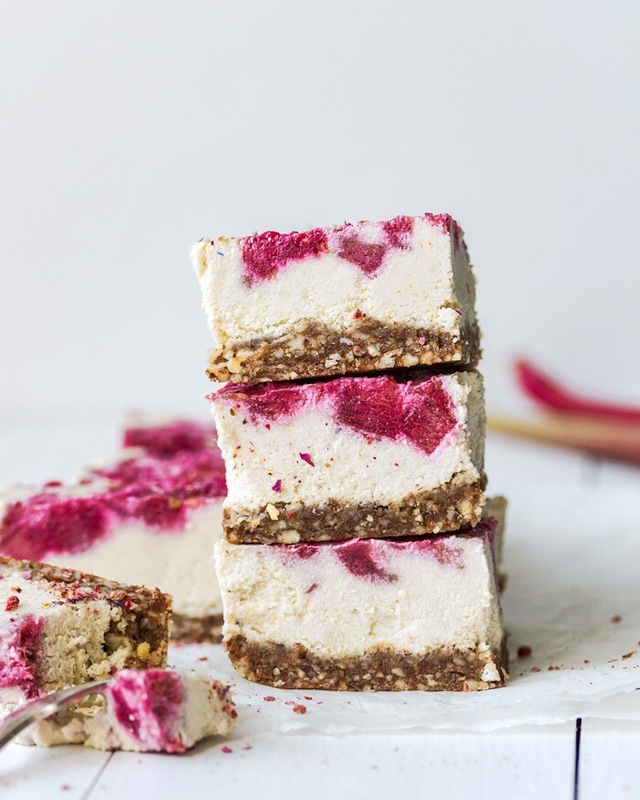 The rhubarb & raspberry combo goes so well with the nutty based and creamy coconut cashew creme. This cheesecake is not raw as I used soy yogurt, and I cooked the fruit. 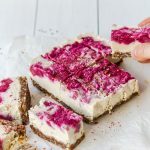 I don´t know if rhubarb would be enjoyable raw, so maybe try using berries instead and more coconut cream instead of soy yogurt. I try to avoid oils so I try to avoid coconut oil as well. 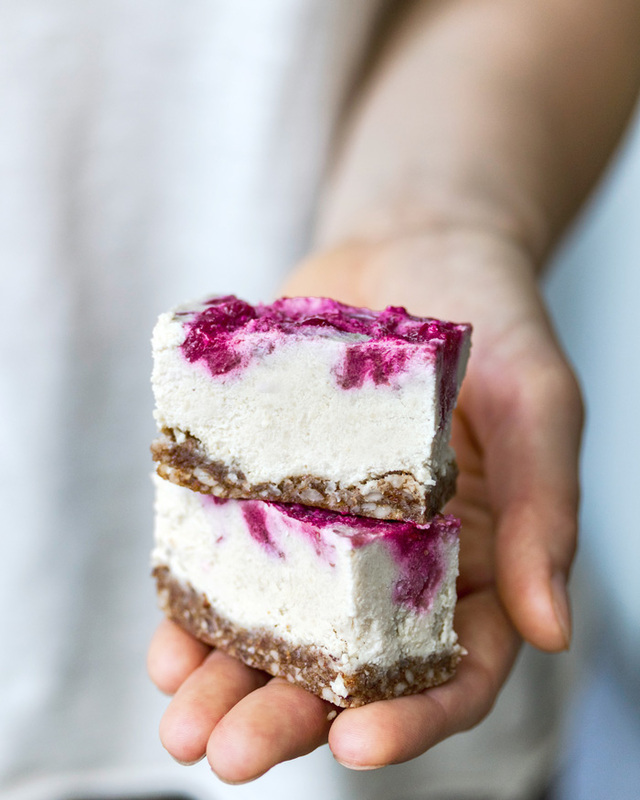 Most raw cakes are made with coconut oil. 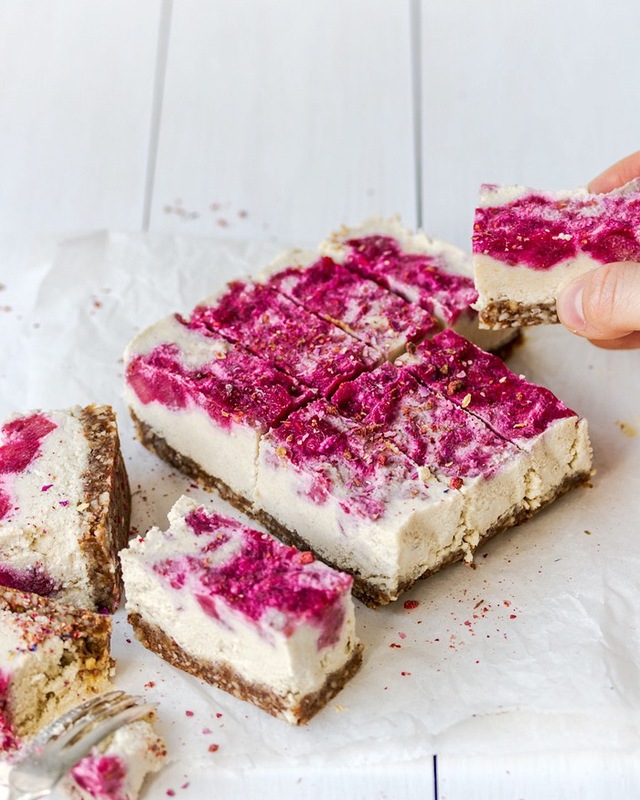 I will try to make a raw cake soon without coconut oil. Do you have a specific recipe request? The rhubarb season is pretty short so make the most of it and try this delicious dessert. Start with preparing your rhubarb. Wash and dice your rhubarb stalks. Add them in a medium-sized pan with the raspberries, lemon juice, and zest and also a bit of date syrup. Cook your fruit and after boiling let it simmer for 10-15 minutes. For the base mix the walnuts, date paste, and water in a food processor. You can also use dates instead of the date paste. Line a small baking tin or a few muffin forms with some baking paper. Make sure that the baking paper also covers the sides. Press your base in the tin and put it aside. For the cream rinse your soaked cashews and mix with the rest of the ingredients in a strong food processor. Mix until it gets nice and creamy. Add more syrup if needed. Pour your cream in the tin on the base. Carefully add your rhubarb-strawberry mixture. Use a spoon or a knife to spread it out. Put your cake in the freezer for at least 3 hours. Depending on how warm your kitchen is, take it out 15-25 minutes before serving. You can also freeze the slices for days and eat them later on. *put a tin of coconut milk upside down in the fridge and let it sit for a night. The next day the hard part of the coconut milk will be on the top. You need this part of the coconut milk for the recipe. Hi, This is a great quick recipe, thank you for sharing it with us. I am a food lover and I love making bread and butter pudding.